Onward and upward! 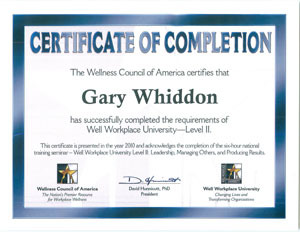 WELCOA does a great job to enable individuals to really learn what is necessary to lead a wellness campaign for a firm. Having completed Level 1 and Level 2 training, I plan on completing the last Level 3 courses before the end of the year. As health insurance costs continue to rise, employers will place more emphasis on controlling future costs through wellness. Moreover, in 2011 our government will be providing eligible firms “wellness grants” to promote wellness in the workplace. This means that employers will look to find capable individuasl to help them build and monitor an ongoing wellness program. A “results oriented” program instead of a “passive join 24 hour fitness if you want”. Low participation does little to change health care costs, so employers must provide “financial incentives” to employees who reach their goals. Employees will not be forced into a wellness program, but financially encouraged. Since healthy lifestyles to not change overnight, employees will have to be educated on an ongoing basis about diet, exercise, stress, smoking, obesity, plus benchmark their current way of life to show measurable lifestyle changes from participating in a wellness program. Healthier employees do reduce health claims, workers’ comp claims, and sick days. What about offering time off for “health days”, instead of “sick days”? Get involved with wellness with me!